Remarkable yet controversial, the Prussian-born Protestant missionary Karl Friedrich August Gützlaff (1803-51) sought to spread Christianity in the Far East. A gifted linguist, he sailed to Siam and worked on translating the Bible into Thai. The British missionary Robert Morrison had fired his interest in China, and Gützlaff later focused his evangelising efforts there, learning several dialects and distributing translated literature. Furthermore, he served as an interpreter for the East India Company. 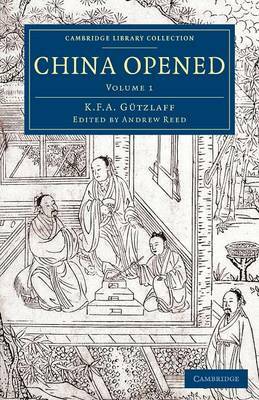 Also reissued in this series are his Journal of Three Voyages along the Coast of China (1834) and A Sketch of Chinese History (1834). Edited down into two substantial volumes by the Congregational minister Andrew Reed (1787-1862), the present work was published in 1838. It aimed to generate support for the missionary cause by giving Anglophone readers deeper insight into an unfamiliar civilisation. Volume 1 addresses geography and topography, before moving onto history, language and culture.